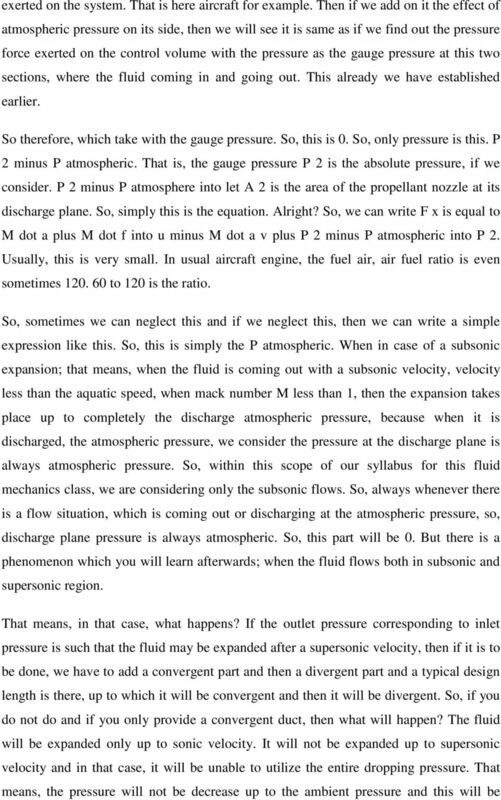 Download "Fluid Mechanics Prof. S. K. Som Department of Mechanical Engineering Indian Institute of Technology, Kharagpur"
1 Fluid Mechanics Prof. S. K. Som Department of Mechanical Engineering Indian Institute of Technology, Kharagpur Lecture - 20 Conservation Equations in Fluid Flow Part VIII Good morning. I welcome you all to the session of Fluid Mechanics. Well, in the last class we discussed about the forces that is being exerted by a fluid jet impinging on a flat and curved surfaces. Now, today we will again see that the application of momentum theorem to a control volume. 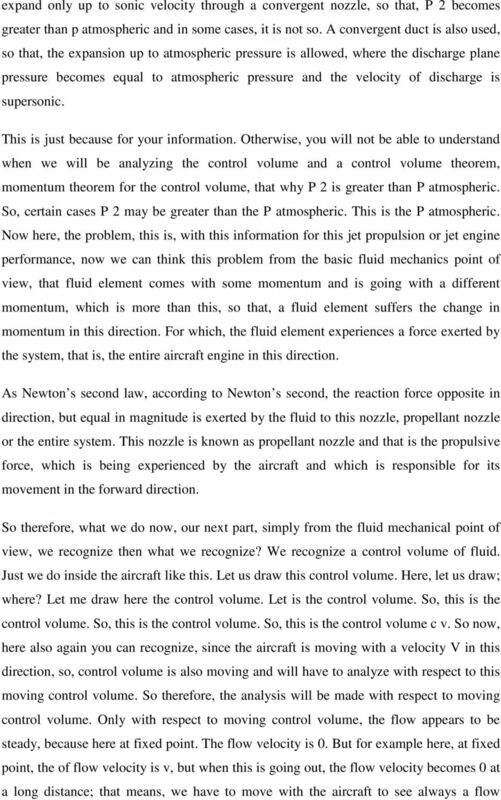 By the application of the momentum theorem to a control volume, we can solve many other practical problems of interest. 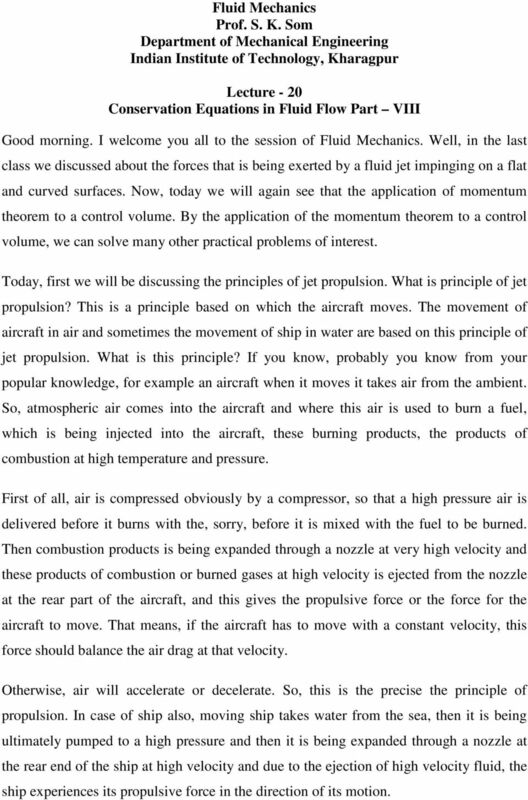 Today, first we will be discussing the principles of jet propulsion. 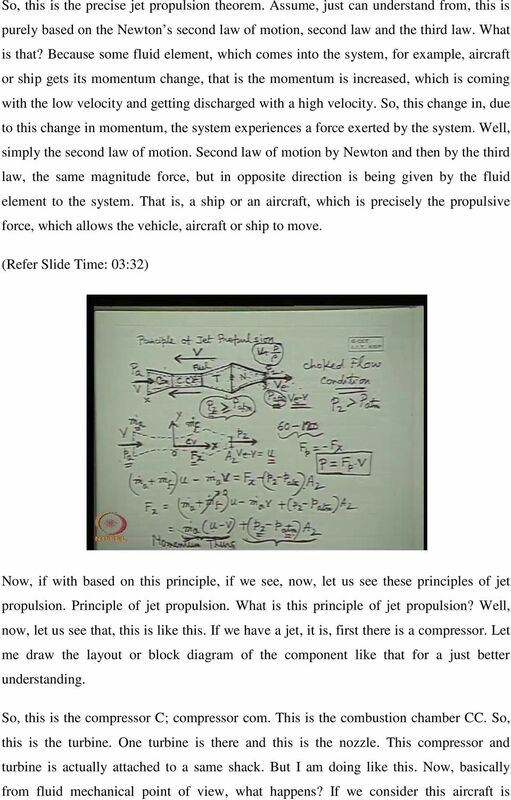 What is principle of jet propulsion? This is a principle based on which the aircraft moves. The movement of aircraft in air and sometimes the movement of ship in water are based on this principle of jet propulsion. What is this principle? If you know, probably you know from your popular knowledge, for example an aircraft when it moves it takes air from the ambient. So, atmospheric air comes into the aircraft and where this air is used to burn a fuel, which is being injected into the aircraft, these burning products, the products of combustion at high temperature and pressure. 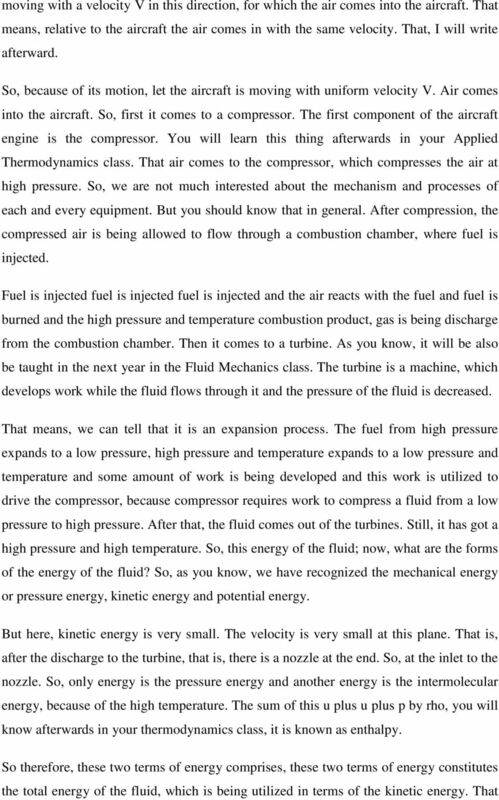 First of all, air is compressed obviously by a compressor, so that a high pressure air is delivered before it burns with the, sorry, before it is mixed with the fuel to be burned. Then combustion products is being expanded through a nozzle at very high velocity and these products of combustion or burned gases at high velocity is ejected from the nozzle at the rear part of the aircraft, and this gives the propulsive force or the force for the aircraft to move. That means, if the aircraft has to move with a constant velocity, this force should balance the air drag at that velocity. Otherwise, air will accelerate or decelerate. 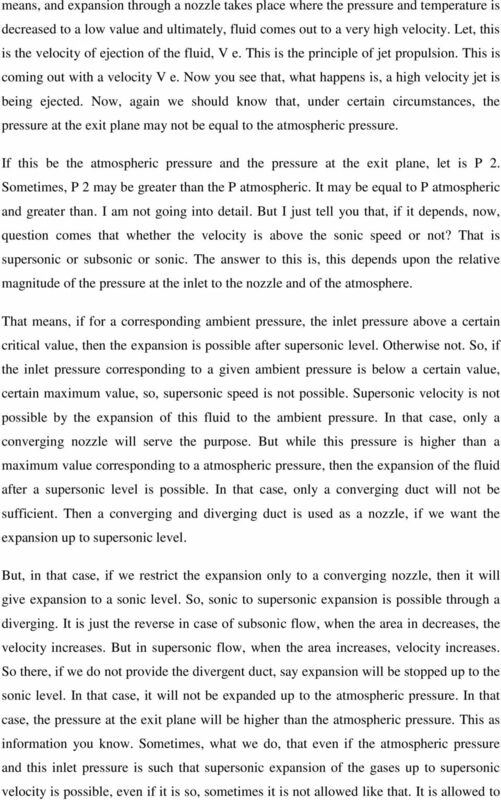 So, this is the precise the principle of propulsion. In case of ship also, moving ship takes water from the sea, then it is being ultimately pumped to a high pressure and then it is being expanded through a nozzle at the rear end of the ship at high velocity and due to the ejection of high velocity fluid, the ship experiences its propulsive force in the direction of its motion. 14 change of momentum of the system is this minus this divided by delta t, for a delta t time. Delta t tends to 0. Now, if we make this, you will get M V and M V cancels. 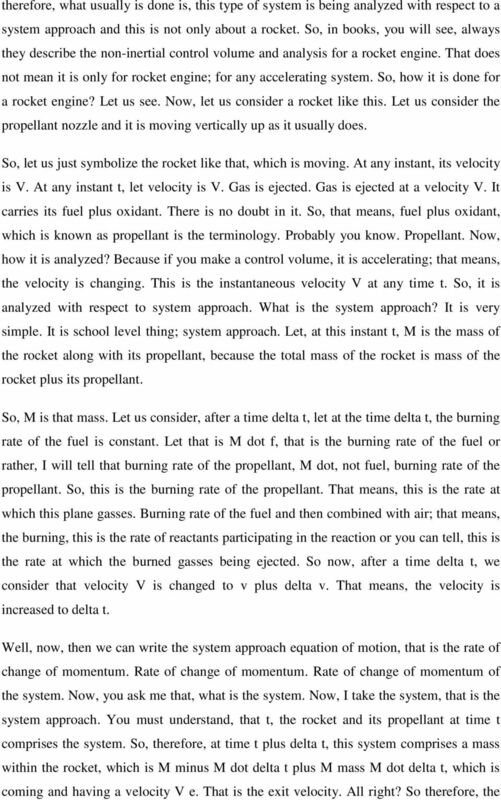 So, you get M into delta V by delta t. So therefore, we can write this expression. Simple mathematics. 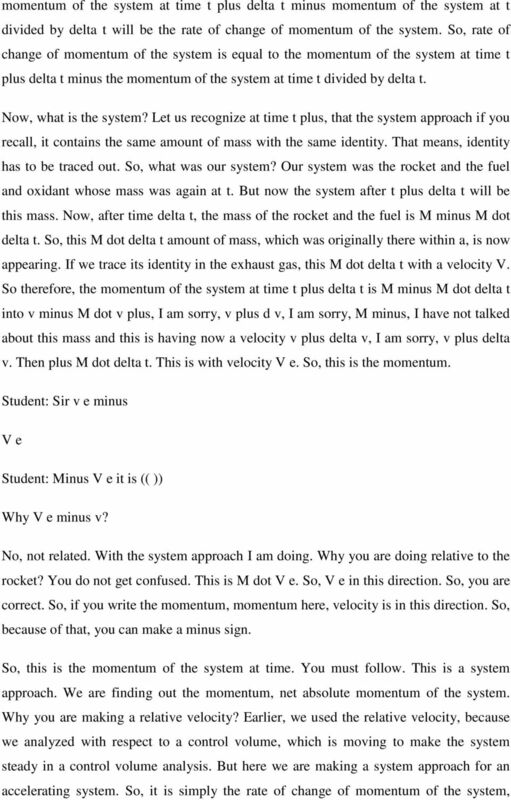 Limit M into delta V by delta t and minus M dot into, what we can write? Delta V M dot into V plus delta V plus V e times delta t divided by delta t. Delta t tends to 0. So, this delta t. Delta t cancels. So, only trick is that, when delta t tends to 0, this also tends to 0. V e is constant. So, this is alright. So, the limiting value will be V plus V, where delta V also tends to 0, when delta t tends to 0. So, delta t delta t cancels, but here delta V by delta t. So, this tends to 0 and this tends to 0. So, according to our calculus, so, this represents the rate of change of velocity with respect to minus M dot V plus V e. So, this is the rate of change of momentum. So, this is the rate of change of momentum. Now, what is V plus V e? 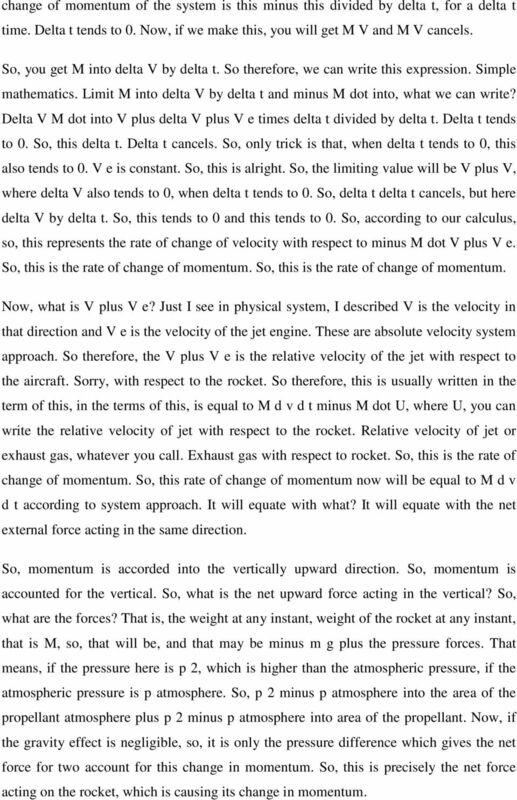 Just I see in physical system, I described V is the velocity in that direction and V e is the velocity of the jet engine. These are absolute velocity system approach. 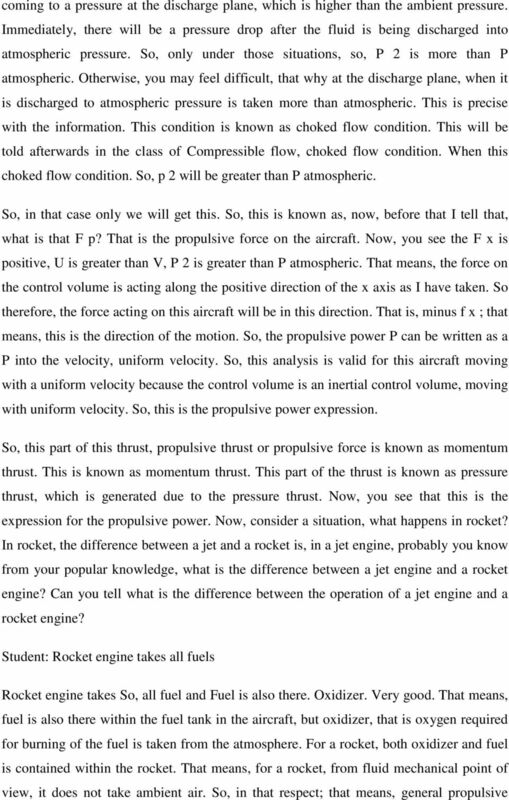 So therefore, the V plus V e is the relative velocity of the jet with respect to the aircraft. Sorry, with respect to the rocket. 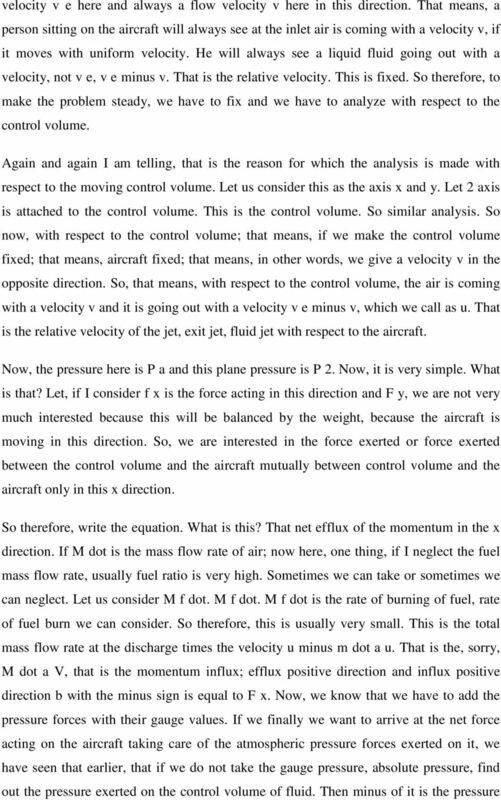 So therefore, this is usually written in the term of this, in the terms of this, is equal to M d v d t minus M dot U, where U, you can write the relative velocity of jet with respect to the rocket. Relative velocity of jet or exhaust gas, whatever you call. Exhaust gas with respect to rocket. So, this is the rate of change of momentum. So, this rate of change of momentum now will be equal to M d v d t according to system approach. It will equate with what? It will equate with the net external force acting in the same direction. So, momentum is accorded into the vertically upward direction. So, momentum is accounted for the vertical. So, what is the net upward force acting in the vertical? So, what are the forces? That is, the weight at any instant, weight of the rocket at any instant, that is M, so, that will be, and that may be minus m g plus the pressure forces. That means, if the pressure here is p 2, which is higher than the atmospheric pressure, if the atmospheric pressure is p atmosphere. So, p 2 minus p atmosphere into the area of the propellant atmosphere plus p 2 minus p atmosphere into area of the propellant. Now, if the gravity effect is negligible, so, it is only the pressure difference which gives the net force for two account for this change in momentum. 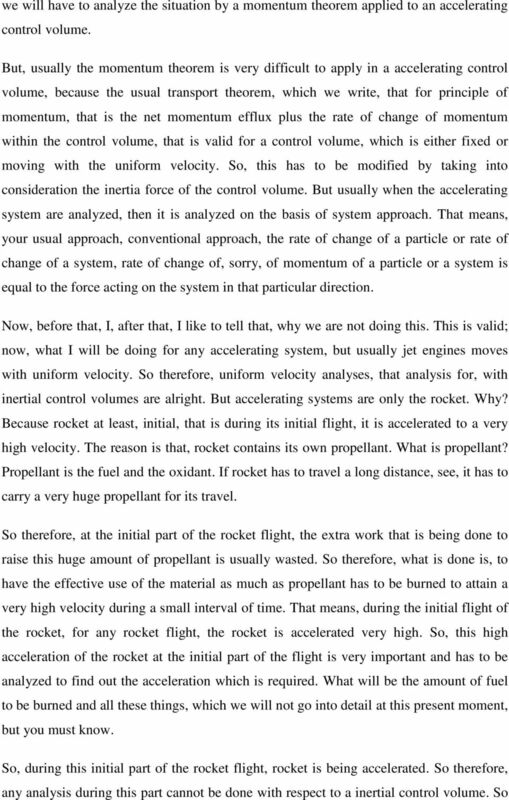 So, this is precisely the net force acting on the rocket, which is causing its change in momentum. 16 linear relationship with a radius. That is the basic equation of the tangential velocity for a solid body rotation. You understand? So, these situations will be analyzing in the next class. How the pressure varies in these cases of fluid flow. 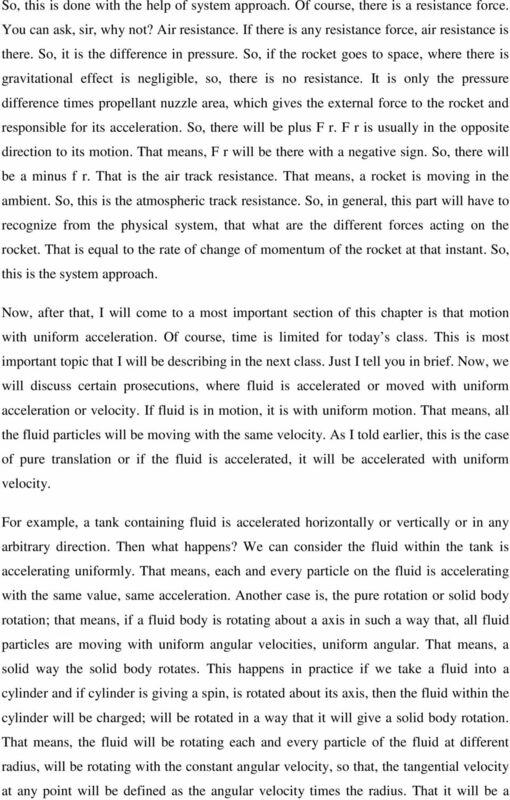 That, if fluid is uniformly accelerated or uniformly moved or a fluid is given a uniform rotation. That means, a solid body rotation or rigid body rotation. What is the pressure field within the fluid? This will be our discussion in the next class, because time is up. I cannot start this, because I cannot finish it. Thank you. 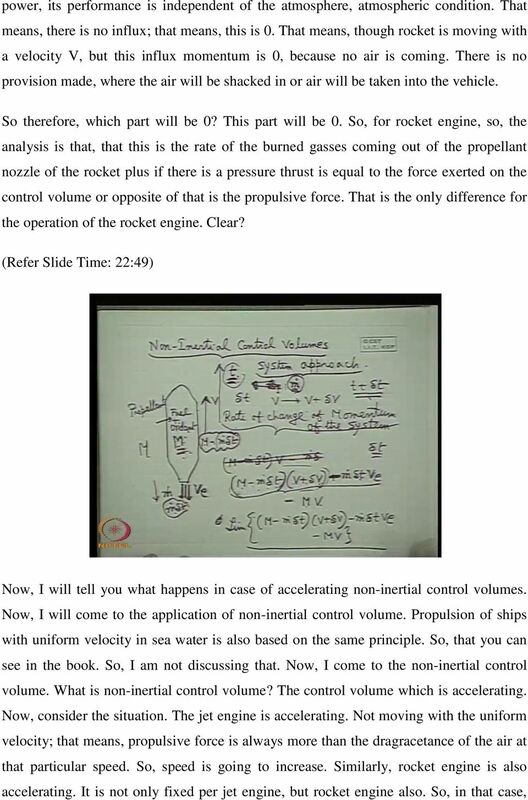 Applied Thermodynamics for Marine Systems Prof. P. K. Das Department of Mechanical Engineering Indian Institute of Technology, Kharagpur Lecture - 10 Steam Power Cycle, Steam Nozzle Good afternoon everybody. a) To bring the inlet flow to the engine with the highest possible stagnation pressure. This is measured by the Inlet Pressure Recovery, π d.
Gas Turbine cycles and Propulsion system. 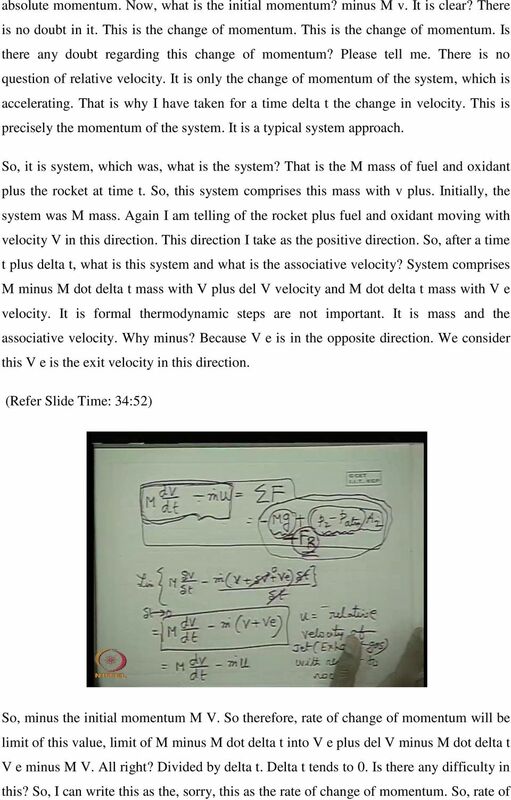 Sarika Goel 3 rd year,chemical Engineering, IIT Delhi Guide : Prof. Gautam Biswas & Prof. S.
Applied Thermodynamics for Marine Systems Prof. P. K. Das Department of Mechanical Engineering Indian Institute of Technology, Kharagpur Lecture - 1 Introduction & Some Definitions Good afternoon everybody. is the stagnation (or total) pressure, constant along a streamline. Newton s Laws. Physics 1425 lecture 6. Michael Fowler, UVa.